A Directional Waverider Buoy is installed at a location offshore from Lakes Entrance to measure wave height, period, direction, and surface water temperature. Mariners should note that this buoy is located at an approximate position of S 37° 54.9075′ E 147° 57.9379′ (WGS 84). A long elastic mooring system has been utilized to secure the buoy and consequently the position of the buoy may vary with tide and currents. Mariners are directed to navigate with caution when transiting the area and to remain at least 200m clear of the buoy. No vessel is to moor to the buoy at any time. The buoy displays the following light characteristic: Fl(5)Y. Tide measuring equipment is installed to provide near-real time tide data. 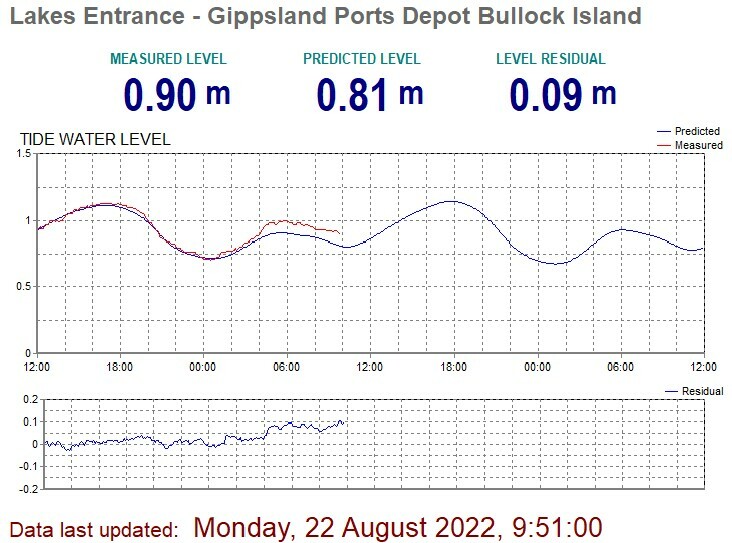 Tide gauges at Lakes Entrance are located in the Entrance Channel midway along the training walls, and at the Gippsland Ports depot jetty on Bullock Island. An Automatic Weather Station is installed to provide measurements of air pressure, air temperature, wind speed and direction, relative humidity and rainfall. Disclaimer: Users of this information accept all risks and responsibility for losses, damages, costs and other consequences resulting directly or indirectly from using this site and any information or material available from it. To the maximum permitted by law, Gippsland Ports excludes all liability to any person arising directly or indirectly from using this site and any information or material available from it. 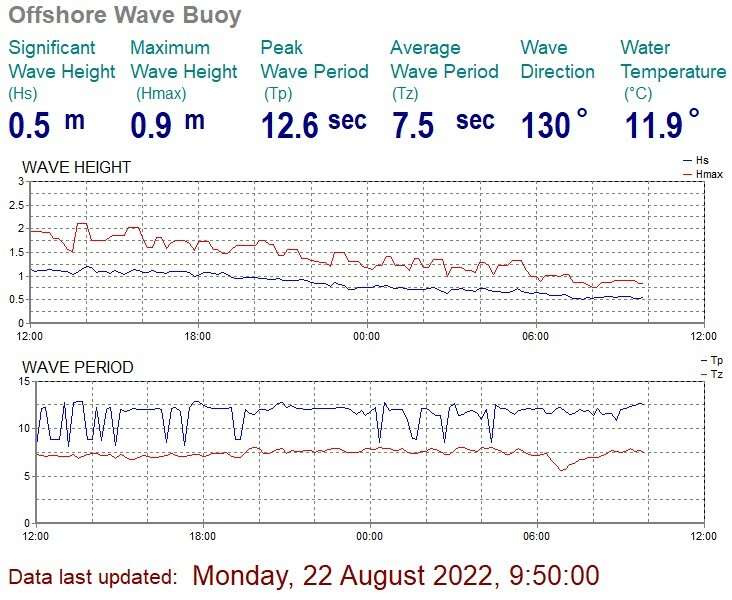 This page contains wave observations from a moored Waverider buoy located approximately 1.5 nm SE of Lakes Entrance, Victoria in 23 metres depth. Position: 37° 54.908′S, 147° 57.938′E (WGS84). This data is automatically generated and is not quality controlled. All times and dates are in Victorian local time. Each ‘observation’ (or record) is obtained by sampling the waves for 27 minutes. This page is automatically updated every 10 minutes from available data. Direction The direction from which waves are coming (degrees True) at the peak energy period (Tp). 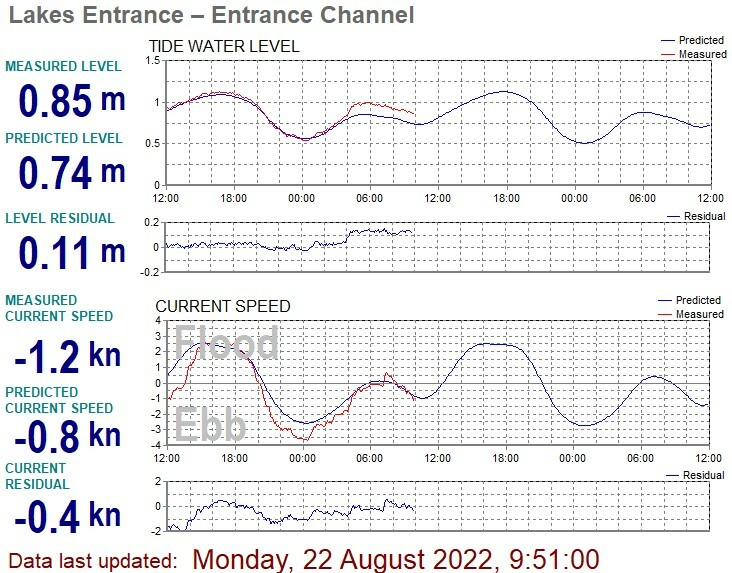 This page contains water level and current observations from sensors located in the entrance channel at Lakes Entrance, Victoria. Location is approximately 150 metres NW of the entrance breakwater. Position: 37º 53.4’ S, 147º 58.4’ E (WGS84). The data is automatically generated and is not quality controlled. Each ‘observation’ (or record) is obtained by sampling water levels and currents at 6 minute intervals. This page is automatically updated every 6 minutes from available data. Measured Level The measured water level at the sensor (metres) above Chart Datum. Predicted Level The predicted tidal water level at the sensor (metres) above Chart Datum. Level Residual The measured level minus the predicted tidal level (metres). This value is positive when the measured level is higher than the predicted level. Measured Current Speed The measured current speed (knots) near the current sensor. An Ebb flow denotes water moving towards the SE. A Flood flow denotes water moving towards the NW. Predicted Current Speed The predicted tidal current speed (knots) near the current sensor. Current Residual The measured current speed minus the predicted tidal current speed (knots). This value is positive when the measured speed is greater than the predicted tidal speed. This page contains wind observations from a sensor located at the southern end of the Eastern Breakwater at Lakes Entrance, Victoria. Position: 37º 53.4’ S, 147º 58.4’ E (WGS84). 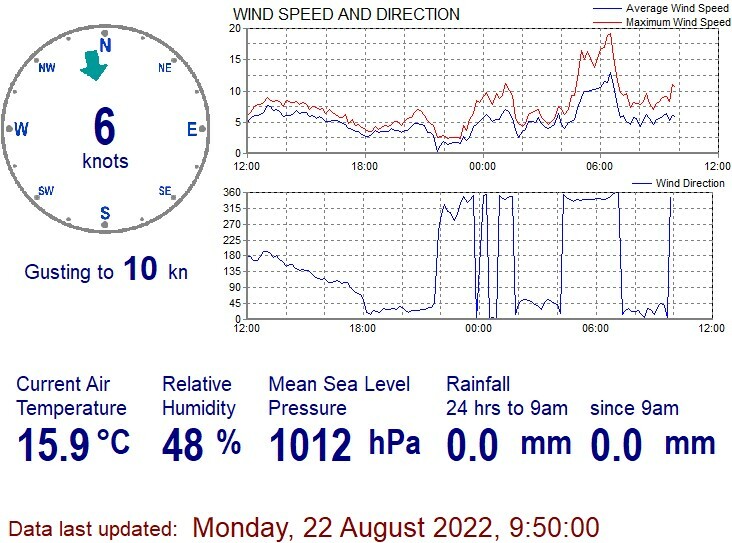 The weather observations are from sensors located at Bullock Island at Lakes Entrance, Victoria. Position: 37º 53.0’ S, 147º 58.3’ E (WGS84). Each ‘observation’ (or record) is obtained by sampling the water levels and currents 10 minutes. Average Wind Speed & Direction This is the average over 10 minutes of data. Speed is in knots. The Direction is the direction the wind is coming from (degrees True). Gust Wind Speed & Direction This is the highest speed sustained for 2 seconds during the 10 minute record. Speed is in knots. The Direction is the direction the wind is coming from (degrees True).